Yesterday the FBI arrested a Massachusetts man, who has been subsequently charged with a number of crimes related to terrorism. This is the latest in a string of plots that the U.S. has successfully thwarted, yet it raises alarms for many Americans who have felt immune from Al-Qaeda-inspired terrorism on U.S. soil. Erik Dahl, of the Naval Postgraduate School, has identified dozens of credible plots (as many as 45 by jihadist-inspired groups or individuals, according to John Avlon) since 9/11, all of which have been either botched by offenders or thwarted by the authorities. Americans should not be too surprised by this latest wave of domestic plots. After all, domestic attacks make up the vast majority of terrorist activity–jihadist or not. Neither should they be too surprised about homegrown AQ-inspired activity, which is simply part of the current wave of terrorist activity around the world, as Karen Rasler and William Thompson tell us. Some scholars have even argued that Al Qaeda-inspired terrorism is simply a “fad” that will eventually go the way of all other other fads. Nonetheless, this brings up three important questions: (1) Will the current wave of jihadist terrorism be replaced? (2) If so, by what kind of terrorism? (3) Where? My answers: (1) Probably. (2) Who knows? (3) Largely in democratic countries, most likely. This chart shows that democracies remain the most frequent targets of terrorist attacks around the world. Additional research confirms that despite all of the concern about terrorism in weak states, democracies also remain the most frequent sources of terrorist activity. There are lots of reasons why, about which much has been written. 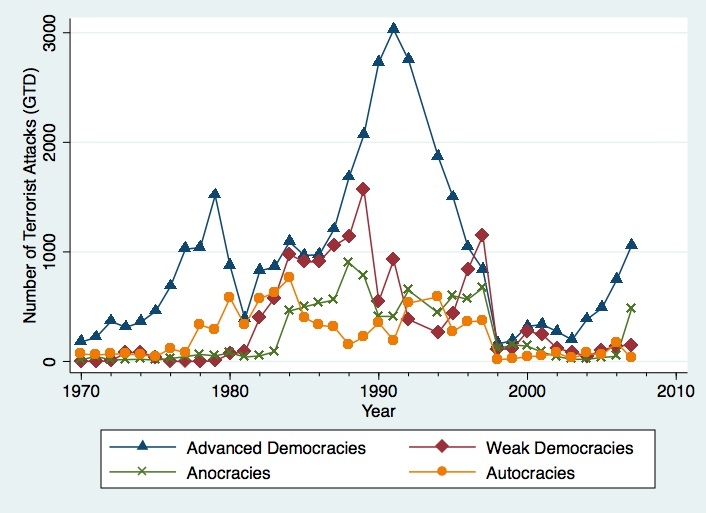 But here’s the good news: terrorism is incredibly rare, even in democracies. As John Mueller insists, a person is more likely to drown in one’s toilet than to be killed (or hurt) by a terrorist. Although there is a fascination with terrorism among the public and in the media, and although it is certainly destructive, violent, and terrifying to those who experience it, terrorist attacks almost never occur. Moreover, in a recent working paper with Joe Young, he and I find that terrorism does not actually threaten “our way of life,” as some argue. Democracies are incredibly resilient to terrorist threats, and although democracies occasionally do circumvent limits on civil liberties, such measures are usually temporary and are typically repealed over time. Martha Crenshaw has found that democracies almost never retaliate against foreign terrorist attacks using military force, although when they do, it can be quite consequential as we’ve seen in Afghanistan. My point is that terrorist plots and terrorist attacks are rare but normal in democracies–and that’s likely to continue. Although terrorism is a nuisance, it is not an existential threat to the United States, nor is it ever likely to be. On the whole, there is nothing to fear but fear itself. The Department of Homeland Security should put that on a billboard. I shan’t dabble in definitions of terrorism because the caveats and qualifications could go on ad nauseam. For those interested in debates on how terrorism should be defined, Chapter 1 of Bruce Hoffman’s Inside Terrorism is great on the subject. I use a fairly noncontroversial definition: terrorism is politically-motivated violence by non-state actors directed at civilians to produce fear in a broader population.